In college I hated to talk in classes. Preferring to take notes in a lecture or write essays, I felt discussion was a barrier to my learning. Back then, I didn’t learn the importance of speaking up and listening in community. Decades later, our Ashram community has changed me. I am transformed from a lone-wolf yogi into a grateful member of the pack! Karuna Beaver, our Boise Meditation Group Leader, always invites us to describe our experience. She gently encourages us with a question, “Who else can you share this stuff with?” For me, this triggers another question, ‘Why would I want to share my experience?’ Now I know the answer: because communicating in community is a major component of true learning. A community is comprised of individuals who share common interests, values and goals — and who talk with each other. Each speaks the same language. Our Svaroopa® Vidya Ashram community is a virtual assembly of seekers who engage in the Svaroopa® Sciences practices. There are many practices, so many of us have entered through different doors. Yet we all speak the same language, communicating our experiences of the Svaroopa® Sciences practices. You’re not asked to believe anything. You are given practices, and the practices give you experiences. You come to knowledge from articulating your own experience, and from listening to what others say about theirs. Yoga is experiential learning. In Svaroopa® Yoga Teacher Training (YTT), a partner-pairing process teaches us how to apply what we have seen in demonstrations and have on our pose handouts. But it’s in the communication between a pair of partners that experiential learning happens. Receiving a pose alignment from our partner, we describe our own experience of it, complimenting and coaching as appropriate. We team-teach our practicum classes, giving compliments and coaching to each other, while receiving both from our supervisor as well. Returning home from Teacher Training, many of us keep in touch with each other and reconnect in future trainings. We ask questions, compare notes and encourage, continuing to learn and evolve together. Thus we form relationships that continue across distance and through time, creating community. The conversation revolves around the teachings of Swami Nirmalananda, delivered by her as well as by our Teacher Trainers whom she has taught and certified. Swamiji replied that ancient yogic texts talk about flowers blooming and plants producing fruits and vegetables out of love for humanity. When I remember this, I am overwhelmed with gratitude. Swamiji’s response to my description gave me a sense of the Love of God outside and inside. Some Shishyas (disciples of Swami Nirmalananda) joined the Ashram community by coming into relationship with Swamiji directly. They immediately recognized her as a revered teacher on their spiritual path. Some resonated with an Ashram ad in a yoga magazine, and found Swamiji’s online Freebies (writings and recorded satsangs). Others became Shishyas gradually over time and others are in the process of deciding how much they want. No matter the entry door, all of us community members come into relationship with Swamiji as well as with each other. We talk, formally in programs and casually anywhere, anytime. Many of us take on seva (selfless service). In serving others, and serving with others in our particular seva, we talk. We communicate about our experiences and develop enduring relationships. These connections weave the tapestry of community. It is a container in which together we deepen and expand our experiences of opening more and more to Self. I have learned that communication in community is transformative. I must speak out loud about my experience to those who are really listening. And I as I listen to them, I hear of something I never imagined and am inspired. Or I hear my own experience in their words and am affirmed. Only then do I grasp what I am coming to know. Being listened to by my Guru and my fellow Svaroopis makes it Real. I sense their presence — their Presence — as Consciousness-ItSelf. The verbal interchange in the context of Conscious communication is transformative. It gives a glimpse of Self-Realization, the goal of the practices, even before the mind can understand it. This entry was posted in Ashram News on January 30, 2018 by Svaroopa Vidya Ashram. It just works! While I meditate every morning, I am not a person who can wake up at 4 am and immediately sit for meditation. Without first doing my asana practice, including Lunge, I would just be meditating on my aches and pains. Doing my asana practice settles me into my Self, with a quieter mind. Then I can effectively meditate on my Self, the focus of Svaroopa® Vidya Meditation. My dedication to daily yoga and meditation practice comes from having herniated three spinal discs 20 years ago. I never want to do that again. It’s either continue my daily asana practice or be in pain. So I start my day by at least releasing lower spine tension and compression. That means I do a tailbone pose, a sacrum pose and Lunge, which opens my spine through the waist area. But if I could do only one pose, I would do Lunge. I discovered that Lunge was “the one” a decade ago, returning home from a long drive to visit my mother. My total drive time was about four hours. If I went to bed without doing a Lunge, I wouldn’t get any sleep. If I did a Lunge, I was OK. I learned to release my tailbone, sacrum and spinal waist area all at once by doing Lunge very slowly. In Deeper Classes, I learned to go into the Lunge, come back all the way and then go in halfway to get a more thorough spinal release. And I learned other Deeper self-adjustments from my teacher who had gone to ATT. For these powerful, advanced self-adjustments, you have to have a teacher trained in them. I have also been fortunate to receive such adjustments from Swami Nirmalananda herself in immersions at Lokananda in Downingtown. After my recent Shaktipat Retreat with Swamiji, another student remarked on how faithfully I adhere to daily, 4 am yoga routine. I explained to her that it prepares me for the Sri Guru Gita chant and opens me to my Self. Consequently, I now experience a sense of my Self, beyond thought, that I never expected. This has been the blessing of my life, as I sense the Light expanding. Even in the midst of constant news about crises in our country and worldwide, I feel profound expansion within our Grace-full community. The world needs our presence, as we clear and cultivate it through our practices. This entry was posted in Ashram News on January 23, 2018 by Svaroopa Vidya Ashram. I recently re-read my 1998 notes on Sutra 2.29. It was clear that I had my work cut out for me even then. Scribbled on the page’s margin was encouragement like “Just say no!” or “You must restrain yourself from these things.” I struggled with the question “How do you live a yogic life 24 hours a day?” It all seemed beyond my grasp. My mind was so busy, I had no idea where to begin. You see, I didn’t understand Grace, the wind that has always been beneath my wings, even before I knew it. Some of my students don’t want the lifestyle change yoga’s limbs provide. Thus, they do actually do less yoga in order to stay in their “comfort zone.” I understand their choice and honor the limb they want to hang out on. Yet yoga is not about happiness or comfort. It is about Self-Realization, the knowing of your inherent Divinity. If you’re yearning for this, you have to still your mind. The eight limbs of yoga specialize in this. Guru’s Grace is the shortcut to the knowing of your Divinity, your own Self. Swami Nirmalananda awakens the arising of your own inner spiritual energy. She describes it this way, “Patanjali teaches you how to dissolve the clouds. By contrast, my Guru simply gave me the sky.” She is comparing the practices you learn from Patanjali with Guru’s Grace. Still, you need Self-Effort. You have to do the hard stuff. Whatever limb you choose to begin with, know that the whole tree is rooted in the Grace of our Svaroopa® Vidya lineage. Baba Muktananda said, “The Self is already attained.” You get to choose how to apply yourself to the process. I started with asana, but I now focus on mantra. What will your focus be in 2018? This entry was posted in Ashram News on January 16, 2018 by Svaroopa Vidya Ashram. Teaching Svaroopa® yoga has kept me on this Divine path. To start, I didn’t think I was going to teach Svaroopa® yoga. I took Foundations to learn some tools for myself since I didn’t live near a teacher. Before I knew it, I was taking YTT Level 1. Grace was guiding me before I even knew what Grace was. The total immersion of the teacher trainings was so powerful. Then, having to teach others what I learned deepened my experience of the Svaroopa® Sciences. Being a student in a weekly class just wouldn’t have done it. I needed to be knocked in the head with the frying pan of Consciousness! When I took Meditation Teacher Training, I had to write and teach about Consciousness. This helped me to understand and more tangibly experience what I had been getting all along. The yoga process and the purpose of asana was so clear. It is spiritual upliftment, rather than just the reliable physical, mental and emotional improvement that begins the process. Knowing and more fully experiencing the purpose of practicing asana shifted my teaching profoundly. Even though I was saying the same words and teaching the same asanas, my understanding of the goal shifted. My teaching experience made my understanding and experience of Consciousness real. If I hadn’t taught, I doubt I would be able to hold onto the full, rich, deep experiences of trainings and retreats. Every class I teach, whether asana or meditation, is an experience of being conscious in Consciousness. It’s great practice for the rest of my life. There, functioning in the knowing of my own Self doesn’t come as easy. When I go into the studio to teach, I light a candle and do arati to the Gurus from our lineage. Then, because the space is shared, I always do a round of incense with the mantra to clear the energy. These practices help me to settle into my Self before I teach. The clearing also opens the way to the inflow of Grace from our lineage. It becomes tangible, not only for me, but my students as well. They know that they’re different when they leave. At the end of class this week, a new student exclaimed that she felt like a whole new person. She was glowing; they were all glowing. Being able to offer the practices and begin able to facilitate that shift for people is a precious gift. I feel such gratitude for what Swami Nirmalananda has given to me. I cannot imagine my life without practicing Svaroopa® yoga and meditation nor without teaching those practices. It’s a deep part of my inner process and spiritual growth. And if I can make a difference along the way in how other people feel in their lives and their spiritual process, then that’s an even greater gift. It’s a Divine seva. This entry was posted in Ashram News on January 9, 2018 by Svaroopa Vidya Ashram. 2018 – A Yoga Year! 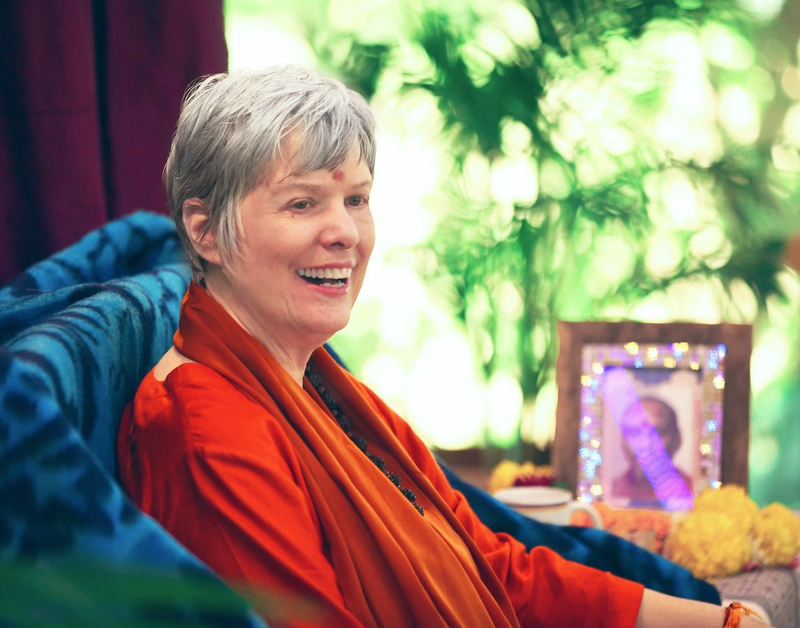 “The purpose of life is two-fold, like the two sides of a coin: 1) to have experiences and 2) to discover who you are,” Swami Nirmalananda began her New Year’s Retreat in Atlanta with this teaching. Being in her presence extended the sweet space between the old year and the new. Grace flowed as she led me into reviewing where I have been and where I am going. I listened intently as Swamiji spoke about being, “present in your own presence.” She explained how it makes a difference in your experience of life. Yoga specializes in cultivating the ability to “live from the place that is un-disturb-able,” she said. Mantra is the most important practice in getting there: “Every repetition of the mantra takes you deeper, so you can experience your experiences from the timeless eternal reality that is your own Self.” How do you want to live? The guided vichara (guided self inquiry) helped me understand where I have been and where I am choosing to go. I choose to follow Swamiji’s suggestion and resolve to make decisions that will take me toward the Self. Then we all made New Year’s resolutions — a single word, a quality we would like to cultivate. Our New Year’s Day began with Sri Guru Gita and a talk by Swamiji, while we were joined by Shishya Members via conference call. During the retreat’s three days, Swamiji and we were supported by Ashram sevites, with Rukmini Abbruzzi serving as chef and Karuna Beaver teaching asana and managing the program. We learned a set of poses for our home practice that will propel us into applying ourselves to our resolve. What a wonderful way to begin a new year, a year that promises to be a wonderful new year – full of yoga! This entry was posted in Ashram News on January 3, 2018 by Svaroopa Vidya Ashram.